Mumbai: Three out of four new-car buyers research online prior to buying the car, with around 43% making the final decision even before their first visit to any dealership, according to one of the key findings of a joint study by consulting firm Boston Consultancy Group (BCG) and online car portal CarDekho. 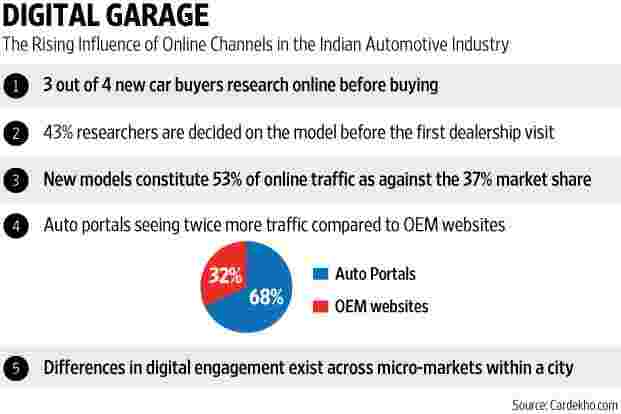 Titled ‘Digital garage—get ready for the digital ride’, the study focuses on the rising influence of online channels in automotive industry. These trends are not limited to metros alone. Tier-II and III towns are also showing similar trends. The survey sampled 1,200 respondents across the country and past proprietary researches conducted by BCG and CarDekho and is a strong indicator of the digital channels influencing the Indian automotive sector in a significant way. Pointing towards the digital car-buying journey an average consumer undertakes; the study says almost a quarter of online visits are long and could take up to 15 weeks. Interestingly, newer car models see a disproportionately high digital traffic of around 53% in comparison to their market share of around 37%. Almost two out of three car shoppers prefer visiting the so-called auto aggregator websites as compared to car company websites when doing an online research. The trend has been fuelling the growth for the auto aggregator sites and they have seen an approximate 50% growth in sessions in the last four years, with mobile gadgets contributing majorly to the growth as compared to desktop devices. As per BCG-CarDekho estimate, the number of internet users is expected to reach around 650 million by 2020. The growing internet penetration is forcing various industrial sectors to reorient marketing and sales approach, according to the study. This transformation is most pronounced in the automotive industry. “Digital is fundamentally re-imagining the consumer journey for auto segment. 75% of car buyers are already researching online and 40% of them consider internet to be their most important source of information for selecting which car to buy," said Sharad Verma, partner and managing director at BCG. This, he said, is going to increase further as consumers become more mature on internet. The plethora of consumer data can open interesting innovation opportunities for auto firms, he said. Nalin Kapoor, chief operating officer, new cars, CarDekho, said to respond to changing consumer habits and needs, automakers and dealers need “to quickly adapt and put in place affirmative strategies and action plans to reach out to a present-day car buyer". A key finding of the report is around the extent of differences in digital activity observed across geographies. Tier-1 cities like Jaipur, Chandigarh, Indore exhibit digital activity levels similar to metros like Bangalore and Hyderabad. Even beyond that, micro-markets in the same city are at very different levels of digital maturity, highlighting the need for a geo-local marketing strategy. The report points out implications for auto firms to win in this digital world. Enhancing digital platforms, designing an integrated online-offline experience of a customer, personalized targeting by effectively leveraging data, developing extremely localized marketing strategies are among the key implications for orginal equipment manufacturers, or OEMs.